Achieve total body workout without leaving the comforts of your home with the Viking 2 AR water rowing machine from First Degree Fitness. This exercise machine is skillfully engineered to give you one of the most effective low-impact, non-jarring, total body cardio-respiratory workout machines that utilizes all major muscle groups including the back, legs, arms, abdominals, and buttocks. Viking 2 is designed with simply the best and most gorgeous wooden frames made from solid American Ash, metal fixtures, and precision components guaranteeing lifetime service. The molded seat and adjustable resistance can accommodate users of different fitness levels in comfort even during longer workout hours. Additionally, this rower is designed with a multifunctional fitness monitor that tracks workout time, stroke count during current workout, total strokes accumulated on the machine, and calories burned to keep you motivated and on track to reaching your fitness goals. Done for the day? Simply lift it on its end and lean it against a wall or hide it away in a closet. This home gym equipment offers more convenience and service for your home gym or fitness center. 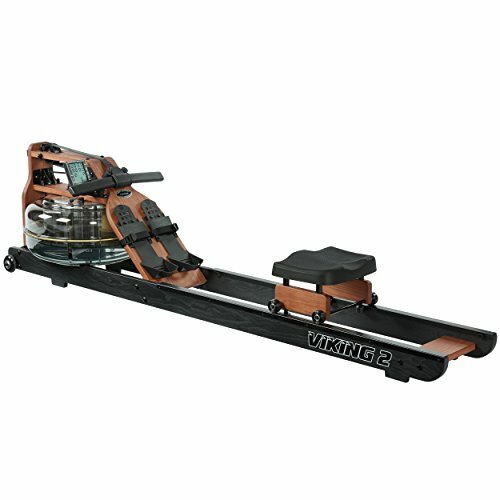 With rowing widely known to be one of the best all-around activities for cardiovascular fitness and strength, the Viking 2 AR is the perfect partner for a healthier, leaner, and stronger you. Get it today to enjoy free shipping and 5-year manufacturer warranty on frame, 3 years on non-wearing mechanical parts, and 2 years on all other parts. LIFE-LIKE WATER ROWING EXPERIENCE - Get the feel and benefits of actual rowing in the water with this exercise machines adjustable fluid resistance that gives smooth transition from feather-light to Olympic sprint rowing stroke. This exercise machine is skillfully engineered to give you one of the most effective low-impact, non-jarring, total body cardio-respiratory workout machines that utilizes all major muscle groups including the back, legs, arms, abdominals, and buttocks. DURABLE WATER ROWER EXERCISE MACHINE - Rowing machine features quality construction and a sleek design: solid American Ash with metal fixtures and precision components that can withstand everyday workout. It is also designed with a durable belt drive that delivers smooth and quiet performance and comes with front transport wheels for superb portability and convenient storage. It can be stored upright when not in use. STATE-OF-THE-ART WATER ROWER - It is equipped with a multi-level monitor that displays time, distance, 500M split time, strokes per minute, calories per hour, watts, and heart rate. This innovative rower also comes with a USB port, a deluxe ergonomic design that reduces sprain on forearms, wrists, and hands, and features height adjustable footplates with straps. WARRANTY AND FREE SHIPPING - Purchase from Dazadi today and enjoy free shipping! Also enjoy 5-year manufacturer warranty on frame, 3 years on non-wearing mechanical parts, and 2 years on all other parts.